Long, long ago, in a faraway place, when I was more naive, less sophisticated than I am now (or so I think) I learned a lesson. In the eyes of the universe it was a minuscule lesson, but, because I was attempting to impress colleagues with my worldliness, it was an embarrassing moment for me. It was totally my fault, as embarrassing moments usually are. I was assuming a cavalier, know-it-all attitude and was chagrined to find that I didn’t…. It was a simple thing. I had recently been introduced to that lovely French apéro: the Kir Royale. For those unfamiliar, a Kir Royale is a glass of champagne with a dollop of cassis (blackcurrent liqueur) added. When the waiter came to take our order, I smiled, knowingly, and ordered a ‘Kir’. Those of us in the know often call things by the diminutive, after all…..
That’s exactly what he brought me. A Kir is a glass of white wine with a dollop of cassis. Naturally, I, gently, corrected him. Naturally, he, less gently, corrected me back. We had two very lovely dinners in our little hotel near Avignon. But we were a little perplexed that we were never offered cheese. Having a bit of cheese between the main course and the dessert is de rigueur in France and we normally indulge. But, we weren’t offered any, and, as the portions were rather large, we didn’t really feel the lack. Carte: the paper/cardboard document that has the various food choices listed. I was given, as is also common in France, a Carte with no prices. As a proper lady, I shouldn’t be concerned with such mundane things as cost…. I probably couldn’t grasp the meaning anyway…. On one side of the Carte was an explanation of the ‘Menus’ or the various combinations of first, second, third, etc. courses one could order. On the other side were the choices: 2 for the first course, 2 for the fish, 2 for the meat, etc. Because there were only 2 choices in each category we assumed (yes, I know) that there were no seperate ‘a la carte’ choices, or, if there were, they were on a different ‘Carte’, and we were looking at the ‘Menu’ choices. We opted for the first ‘Menu’: first course, main, cheese and dessert and that is how we ordered. (Thus the puzzlement over the lack of cheese). When we checked out, our restaurant bill was about 30% higher than expected. I explained that we had thought we were ordering the Menu. I commented about our surprise at the lack of cheese. She said something to the effect that A la Carte portions are larger. I said that is exactly the reason we always order the menu. We stared at each other a moment. She corrected our bill to reflect the menu price…. But gently chided me to be more explicit the next time. Have I learned the lesson this time? Maybe…. Only time will tell…..
How to save on dirty dishes. Cook the cauliflower in with the pasta! Then I must submit it to Presto Pasta Nights, founded by, Ruth, of Once Upon a Feast and hosted this week by Foodie Tots. Visit her blog on Friday for the delicious round-up! By cooking the cauliflower with the pasta we not only save a pan, but add flavor to the pasta. To serve, put the Cauliflower Pasta on a small platter and lay the chicken on top with the rest of the sauce. Peel and chop the onion. Sauté onion in oil in nonstick skillet over medium-high heat. If using uncooked chicken breasts: when onion starts to brown, move it to the sides of the pan and sauté chicken breasts until lightly browned. Note: I often cut the breasts in half; I think it looks nicer. Add thyme, mustard, wine, and stock. Stir to combine. Cover, reduce heat and simmer until chicken is done, about 15 minutes. 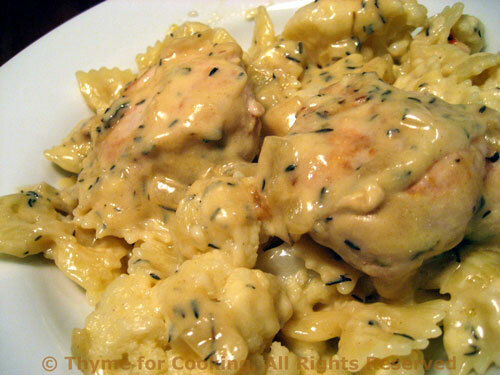 If using cooked chicken: add to onions in skillet with thyme, mustard, wine, and stock, simmer until heated through. For both: Dissolve cornstarch in chicken stock. Uncover, increase heat and add cornstarch. Stir until sauce is thickened. Remove from heat and stir in yogurt. Take 1/2 cup of the sauce and toss with the Cauliflower Pasta. Arrange pasta on platter, sprinkle with cheese. Lay chicken on top and serve, remaining sauce on the side. Or skip the chicken…. You could add tuna…. Or shrimp…. Heat a large pot of water to boiling over high heat. Add a pinch of salt if desired. (No oil) Cut cauliflower into florets. When water is boiling add pasta and cauliflower. Cook until both are done – assuming app. 11 minutes cooking time. If your pasta takes longer, wait a few minutes before adding the cauliflower….or vice versa. When done, drain well. Put back into the pot. Add mustard sauce and toss to combine. 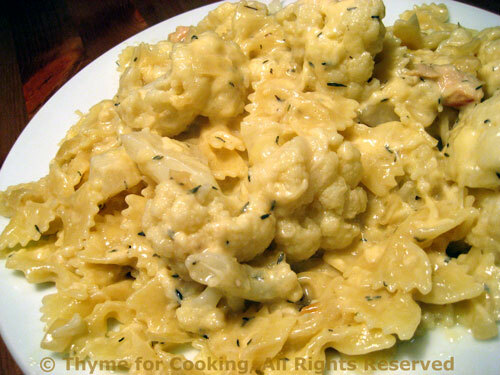 Spoon cauliflower pasta onto a platter, sprinkle with cheese, top with chicken and serve. When I saw “cauliflower pasta”, I thought you were making your pasta with cauliflower water or pureed cauliflower or something like that. Ha. Talk about having to learn lessons! Love the sound of this dish though. Rats, can’t have it tonight; we just finished off a head of cauliflower and will have to wait til we’ve finished the green beans in the fridge. Looks most lovely to me. Some of life’s simplest lessons hare the hardest to learn 😉 why, just because. 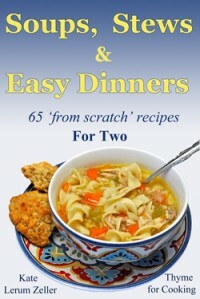 Not sure which I love more…your stories or your recipes. Once again, it’s a tie. Thanks for sharing with Presto Pasta Nights. I’ll definitely be doing the pasta! This looks absolutely beautiful. I can’t wait to try it. What a simple and tasty sounding sauce. very nice. i love mustard. ever made eggs in mustard sauce? thats my favorite!